INCITE » Caroline Martel, "The Film Prayer"
Above, here, we have a material trace of the “Crawley Films Prayer.” Might we speculate that this enchanting viral instruction sheet was, in fact, created by Crawley, a Canadian film production company long recognized for its astute and pioneering use of public relations? So, was The Film Prayer another publicity stunt brought to us by the movie maverick Budge Crawley? If the answer is not readily apparent on the Internet, could it be found on the telephone? If its author remains unknown to this day, The Film Prayer’s rhymes still resonate. 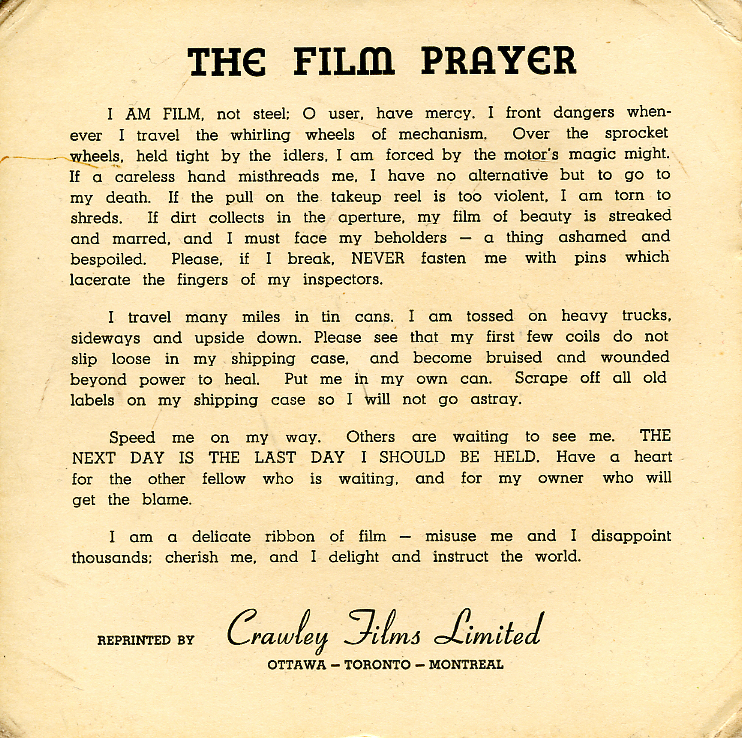 In one film course that I recently taught, after three attempts to show a DVD, then its backup copy, in three different machines, it occurred to me that maybe The Film Prayer should be invoked. I asked the students if they had heard about it, and they had! Like a legend, made of myth and matter from the past and present, The Film Prayer endures because it speaks to the residual problem of the instability of media, and the recurrent need to mediate the way we interact with them. So before my final attempt to play the optical disc, we read the Prayer out loud in class, to no avail: My Phantom of the Operator (2004) still looked like a self-scratching video. The Film Prayer’s powers, it seems, don’t extend to other media formats. With all of the daintiness of “new media” (its finicky data-based supports, its fragile bits), perhaps we need – more than ever – some wise and witty words: a new Prayer for the media of our era. 2. Marius Barbeau (1883– 1969) is considered a founder of Québécois and Canadian anthropology. Caroline Martel is an award-winning documentary filmmaker, artist and researcher who has been synthesizing documentary theory and practice for over a decade, with a special interest in archives, invisible histories, labor and audio/visual technologies and heritage. Her first gallery show, the montage installation Industry/Cinema, was presented at New York’s Museum of the Moving Image in 2012.